Plex has just launched on Apple TV for free. As on numerous other platforms, the app lets you stream local media stored on your computer or NAS drive, such as movies, TV shows, photos and music, to your shiny new set-top box. Previous generations of the Apple TV weren’t nearly as hospitable to Plex as the latest one. The first version released in 2007 didn’t support any third-party apps, and the second-gen device from 2010 had to be jailbroken before you could run a barebones edition of Plex on it. Three years and numerous workaround later, Plex found a way to run its app on Apple TV without jailbreaking. This time around, the team had six weeks to work on their app so it would be ready by the time the latest version of the device launched. From the screenshots, the app looks elegant and clean. But more importantly, it gives Apple TV owners a way to stream their existing media collections wirelessly, with detailed information about their content and an easy way to find whatever you want to watch, view or listen to. 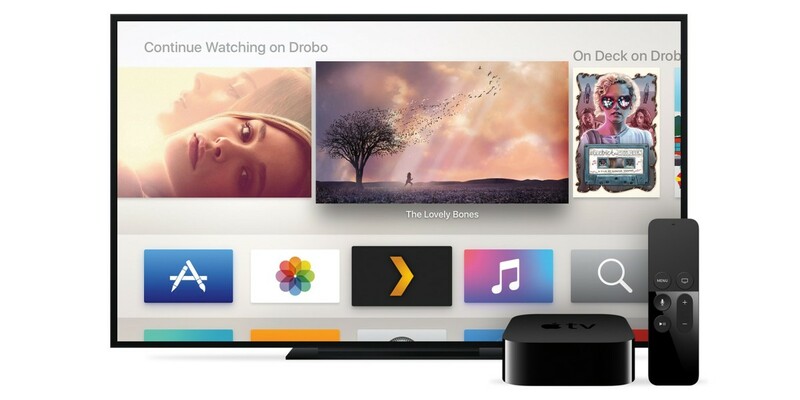 In addition to having your content organized and ready to browse within the app, you’ll also be able to see your featured Plex content right on your Apple TV home screen. Just point Plex in the direction of your media files and it’ll automatically add trailers and Rotten Tomatoes ratings for movies, and allow you to watch TV show episodes back-to-back, just like on Netflix. You can also search for something to watch by director, genre and more. For music, Plex adds artist biographies, support for Vevo music videos and the ability to search by record label or genre. The app also brings a few more useful features including an account management and switching system so you can share your Plex content, channels to surface new content from Vimeo, TED Talks and SoundCloud, and support for queuing up music and video with your phone instead of the Apple TV remote, if you like. While Plex offers up most of its capabilities for free, you’ll need a paid Plex Pass to unlock certain premium features such as the aforementioned Vevo music video support, channels and account management. It costs $40 per year, but you can also get a lifetime subscription for $150.